New Q. I'm confused about how these deferred title transfers work on French tax shelter yachts? If you are looking to buy or sell a sailing or power catamaran, look no further. Our database contains MORE NEW AND USED CATAMARANS FOR SALE than anywhere else in the world. To search the database just enter some parameters into the form on the Search Catamarans Page and click "Search". There are thousands of catamarans for sale here, so you should enter as many parameters as you can think of, and your results will be targeted more exactly. There are power catamarans and sailing cats of all sizes and prices. 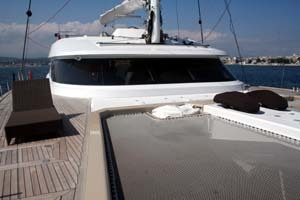 Please also read about the advantages of catamarans that are listed below. If you would like more information on any of the cats you find here, please contact me. I have surveyed hundreds of cats over the past 20 years and can give you a balanced opinion on any of them. How much do our search services cost you? Nothing! Our search service is free to you. The seller pays our fees and we will represent your interests. If you would like to see a report of actual recent selling prices of any boat, just send me an eMail and give me the make, model, year and any other relevant details and I'll send you a full report. I have a private database with all yacht selling prices since 1998 that I share with my loyal clients. Gary Fretz, founder of Yachts International has won a number of sailing Championships including the Marshall Sandpiper Catboat "Worlds" (2018), Mini 12-Meter "Nationals" (2001) and qualified for the US Olympic Sailing Team (1980 - Stars). A graduate of Tulane University, Gary has been managing yachts since 1975 and is a Certified Instructor for American Sailing Association and US Powerboating. With many tens of thousands of cruising and racing miles under his belt and having supervised over 1,400 yacht and catamaran deals he has done it all. Which is why you want him on your team! Interested in having a yacht delivered? 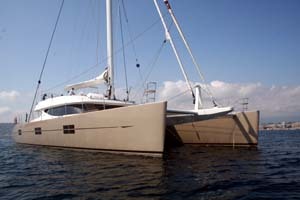 We have a free Delivery Quote Inquiry available right her on Large Catamarans for Sale.com. See more videos on the CATAMARAN MOVIES AND VIDEOS page. Stable, level sailing is more comfortable and less tiring. Crew are less likely to fall overboard and seasickness ​is much less likely. Your martini or champagne glass will not tip over! Catamarans have redundant systems (twin engines and twin rudders) which offers greater safety. "Galley-up" versions make it easier to provision, easier to serve food and "the cook stays part of the party". More and better dinghy storage options make catamaran cruising easier. Large, bright, airy salons function like a "great room" in a house. With wide panoramic views it just feels and is actually much larger than a comparable monohull. Many catamaran salons come with a bar area or galley with breakfast bar and this becomes the focal point of convivial social activity. Cats can be like "condos on the water" because the extra interior volume allows you to fit all the amenities of home. Sleeping cabins are in the corners of the yacht so you feel like there's more space and there's more privacy because no two walls are shared. No more heeling while underway and no more rocking at anchor. Cooking, sleeping, walking are easier and safer on a cat. For those prone to seasickness, the natural stability of a catamaran is a blessing. Wide expansive cockpits and decks are a pleasure to walk or lounge on. Large flybridge areas with extraordinary visibilty have become the focal point while underway and another great spot for having a party. Engines spaced wide apart make steering and docking super-easy. Owner's Suites can be full-beam sized and larger than ever before. Cats are the future and have been maintaining excellent resale value. Compare this to the multitudes of "wedding cake" style motoryachts that depreciate rapidly. Cats are shallow draft which enables more choices when cruising or anchoring. Salons tend to be on the same level as the main deck so there is no endless walking up and down stairs. They can be built "wheelchair-friendly". In higher winds, sailing cats are faster than cruising monohulls. Because of less hull drag, motoring in a catamaran requires less fuel and higher speeds can be attained with less horsepower. To attain greater fuel savings, port and starboard engines can be alternated on long passages. Catamarans can be built as unsinkable and are safer than monohulls. Catamarans don't sail into the wind in light winds with a sloppy sea-state as well as a performance monohull. Contact Gary Fretz- Catamaran Broker for more information.